Using Zotero with Microsoft Word from the Zotero web site. Other videos cover Google Docs and OpenOffice. Zotero allows you to create simple bibliographies or works cited pages, footnotes and endnotes, or in-text citations in a number of citation styles. The default installation of Zotero includes popular styles such as Chicago, MLA, APA, and more. You can download additional styles at the Zotero Style Repository; there are also tools to make your own style. It's easy to create a bibliography from your Zotero library. Right-click one of the selected items and choose Create Bibliography. Choose the bibliographic style you want. Or you can just drag and drop references from Zotero into your document! They'll turn into fully formatted citations. This works with any word processor including Google Docs. Change the default style under Preferences on the "gear" menu. A quick way to add references or a bibliography to your paper is to drag and drop any item from the center Zotero pane into your paper. To do so, you should first set up your citation preferences by clicking on the options button (gear icon) then choosing Preferences and then Export. Once you have set up your preferences, you can drag any items in the center Zotero pane to create notes or bibliographies. Zotero offers word processing plugins for Word and Libre / OpenOffice. The plugin adds a Zotero toolbar to your word processor that allows you to add citations to your document while you write. The plugins should be installed at the same time as you install Zotero itself. If you don't see the Zotero tab in Word, you can reinstall it manually. To add a citation, position your cursor where you want the note to go and click the first button on the Zotero tab ("Insert / Edi Citation"). 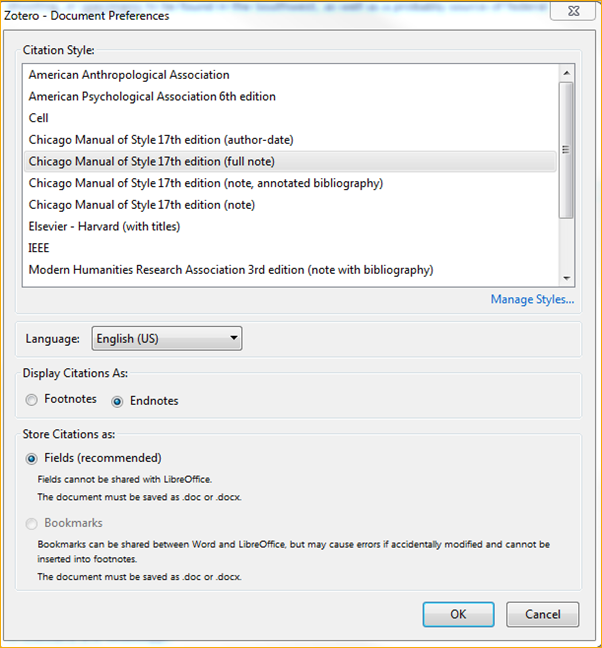 The first time you use Zotero on a document, you will be asked to choose a citation style. The default citation insert method is a search bar. Choose Classic View instead if you prefer a hierarchical browse option. Select the reference you want to cite and click OK. Zotero will add the citation at your cursor. At the end of your paper, click the third button (Add/Edit Bibliography"). Your bibliography will appear, and new citations will be added automatically. To use these styles, you must first download them from the Zotero Style Repository. Click the links to install. Gather the references into a folder / collection and add annotations by using the Extra: field. 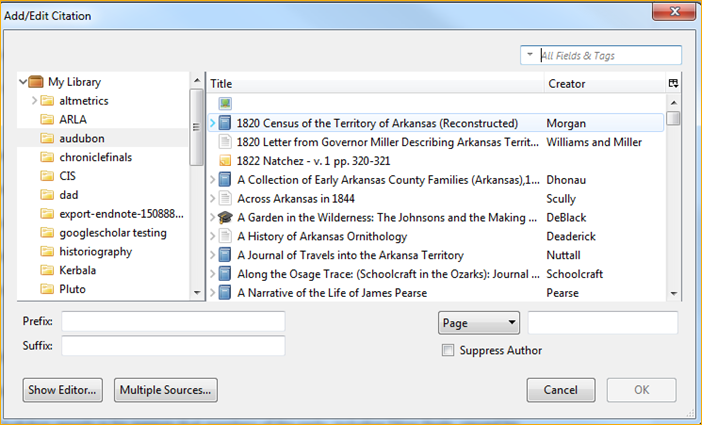 Right-click on the folder / collection name and choose Create a Bibliography from Collection. You can also select specific items in a folder / collection to create a bibliography from with Create a Bibliography from Items. Step 4: Select a Bibliography Format. Choose Chicago or APA annotated styles (the styles you istalled in step 1). Be sure to choose the Bibliography output mode. For us in MS Word or other word processors, you will want to use the RTF output option. Your bibliography should output with annotations.